Voice. It’s what gives our writing meaning. It’s when you read my words and you say to yourself, “That sounds exactly like something Kristine would say!” Not the kind of voice that echoes forth when we sing, or laugh with friends, or even argue… ahem…I mean, discuss things with our strong-willed kids. It’s a different kind of voice. Voice is a literary term. It gives personality to our words. My words give me away as a matter-of-fact, keep-it-simple kind of girl, but when I try to get too fancy – too fluffy – my voice gets lost. In John chapter 10, Jesus is once again approached by Jews who try to twist his words and manipulate them to fit their schemes. Jesus lets them know right quick-like – they can’t hear his voice because they are not his sheep. No fluff there, folks. Lord, thank you that I am one of your sheep! God’s voice is unmistakable to His sheep. Ever wonder why you can be reading the Bible, and a passage or phrase seems to grip your heart or send warmth flowing from the top of your head to the tip of your toes? 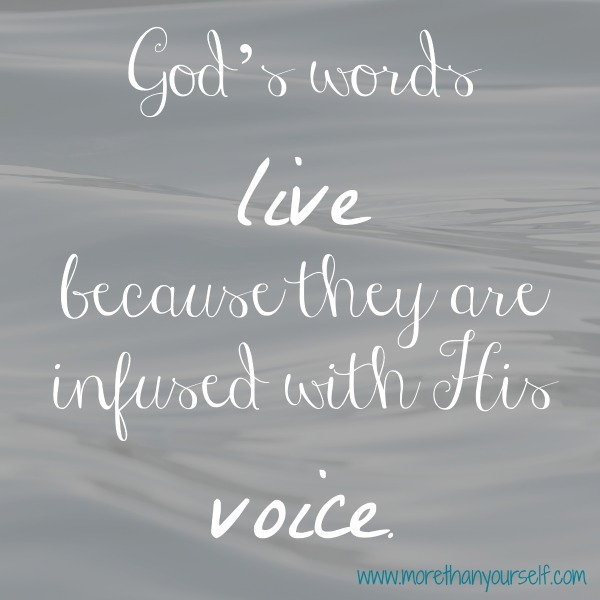 God’s words live because they’re infused with His voice. Beginning this Wednesday, I will be posting about 15 Valuable Verbs of the Bible. Looking at the powerful ways God calls us to action with these action verbs will equip us as we wrap up 2014 and prepare for the New Year. The series will end on New Year’s Eve, with a recap of the 15 Valuable Verbs, and FREE printable bookmarks as a reminder of our purpose. I hope you’ll join me. To have a short reminder sent directly to your inbox each day of the 15-day devotional series, simply subscribe to the blog by entering your email address on the right-hand side of this page. I just love convenience, don't you?? See you Wednesday!